Okay...I burning a 'Mac & PC' CD-ROM and using 'invisible'/platform checkboxes so files only show on whichever platform disc is inserted into. The issue is on the Mac side, I'd like the icons in the 'Auto-open disc window' to be a larger setting than the default size Toast uses (see images). Anyone have any workarounds or editing of some kind of resource file or something...? Also, anyway to set window size as well while I'm at it? The custom icons size and the window size are stored in an invisible settings file inside each folder, or here at the root level of a volume. So to have those settings transferred to an optical disc, you have to work with a temporary partition, like a virtual disk in which you can prepare everything. When everything is set the way you want it, unmount and re-mount, to check if the settings were stored correctly. 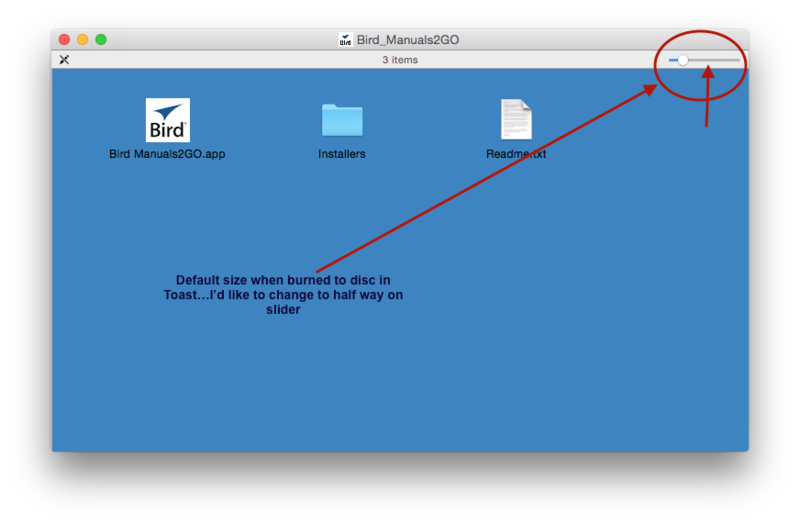 Then prep/build your disk in Toast, by dragging the volume icon to the Toast window. I’m not sure if the Toast options (Auto-open and custom background color) update or replace those other settings; so that may need extra checking. Edit: The above was from memory. I checked and it doesn’t work that way for “Mac & PC” format (but it does for “Mac Only”) in newer versions of Toast. I won’t be testing Toast 8, though. 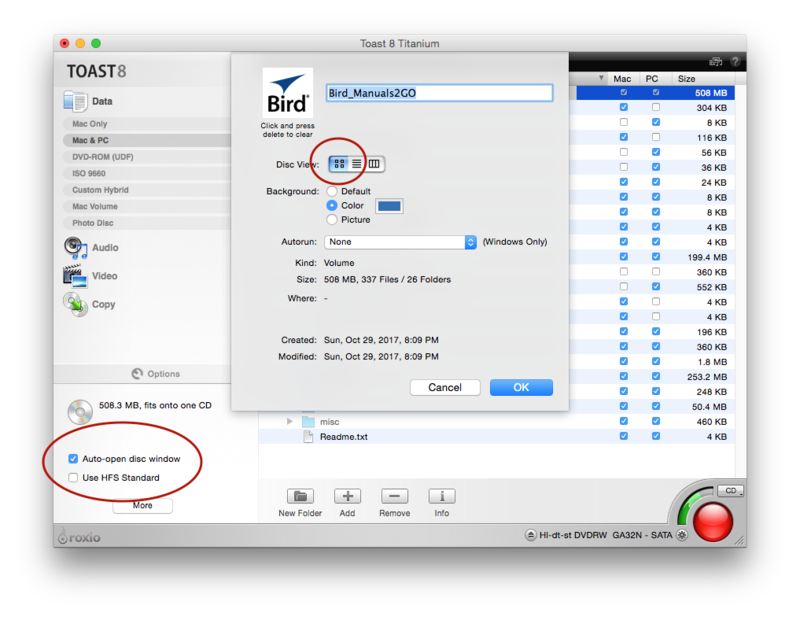 If disc capacity permits, you could make a Custom Hybrid disc, with no shared files, but with the Mac volume completely separate from the PC volume, in order to have more control with Toast.